California, a liberal state, a sanctuary and haven for immigrants including the illegals, ironically as friendly it is to society’s “disadvantaged” and the aliens is not as good to many of its citizens given the many day-to-day governance issues they have to deal with. San Francisco, a major metropolitan city in the state, is no exemption. San Francisco has for a number of years already has a clear, grave problem with its dirty streets. The city’s dirt could not be more literal than having a stinky problem as having poop on public sidewalks. That is something 24-year-old Sean Miller realized immediately when he moved to San Francisco from Vermont. So gross was the problem that Miller has gotten used to having to dodge human and animal excrement on walkways in his South of Market neighborhood. With that “Snapcrap” was born. 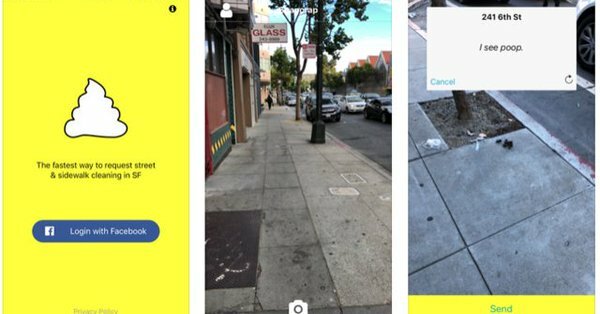 It is a free app recently launched last week for iOS users which allows users to take photographs of feces on sidewalks and streets and deliver an alert to the city’s Public Works Department. The app’s name is obviously inspired by Snapchat, that popular app that allows users to take photos and videos and share them with chosen friends. Snapcrap’s display even plays off the visuals of the popular social media app bu using an icon with a yellow background and a white poop emoji. Snapcrap uses mobile phones GPS to track the specific location of the poop and creates a ticket so that users can keep tabs on their poop complaints. So far the response to Miller’s app has been good. Less than a week since its launch, Snapcrap has been downloaded almost a thousand times already. Dirty streets have been a perennial problem for San Francisco for years. Public Works Department spokesperson Rachel Gordon said the city receives around 1,300 requests for human and animal waste clean up monthly. San Francisco, along with other metropolitan cities in California including Los Angeles, are suffering from the challenge of staggering numbers of homeless individuals. Gordon also said human waste is often found between parked cars, doorways or other places that provide a semblance of privacy for individuals. App or none, however, the poop problem remains, and is ever a clear indication of how liberals govern. Social media users are also reacting to the news.